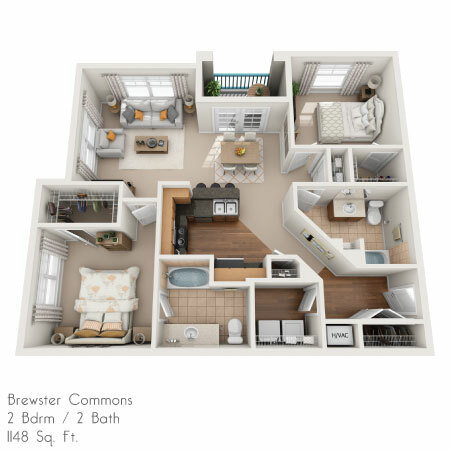 Please send me more information about Brewster Commons at River Chase Apartments. Monday - Thursday 8:30 a.m. to 6:00 p.m. Friday & Saturday 8:30 a.m. to 5:00 p.m. Sunday By Appointment Only. 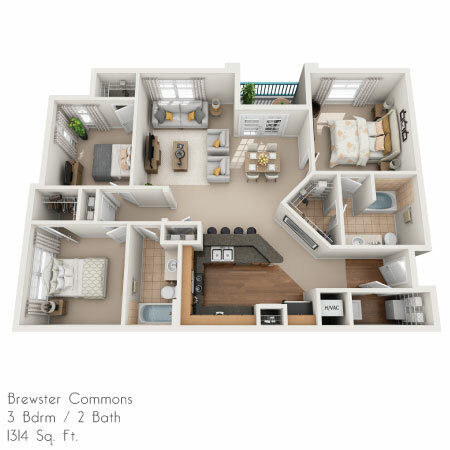 Brewster Commons at River Chase is a peaceful, Covington, LA apartment community located on the Northshore within River Chase community of dining, entertainment and retail at your fingertips. 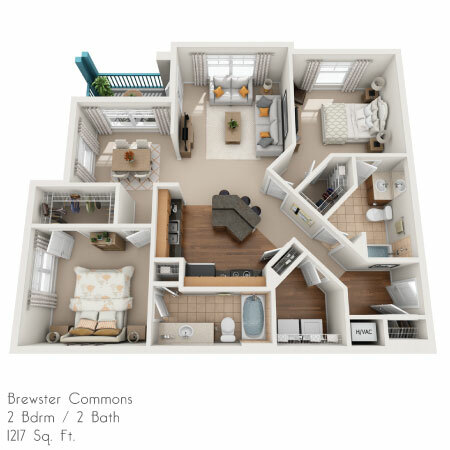 There are multiple floor plans available at Brewster Commons including luxury one, two and three bedroom apartment homes, carports and detached garages featuring extra-large doors. 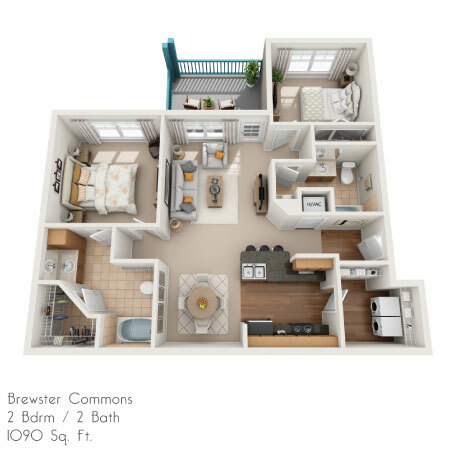 All interiors of Brewster Commons include the latest in energy saving appliances including full size washer and dryers, self-cleaning ovens, microwaves and refrigerators with ice makers. You and your guests can dine on granite counter tops and enjoy wood finish flooring in these apartments in Covington, LA. Personal intrusion alarm systems are also available at Brewster Commons. Relax after a hard day's work at the pool, which is equipped with a bubbling hot tub and a tanning deck for your convenience, or enjoy a nice workout. The Brewster Commons fitness center includes the latest in Precor equipment, complete with treadmills, ellipticals, exercise bikes, and a Precor gym. Outside of the rental center's work-out facility, there is also a fully functional Wii and yoga room as well as a mail center. The Northshore just got a little cozier! Brewster Commons is a great place to live, work and play. If you're looking for an apartment for rent in Covington, La. 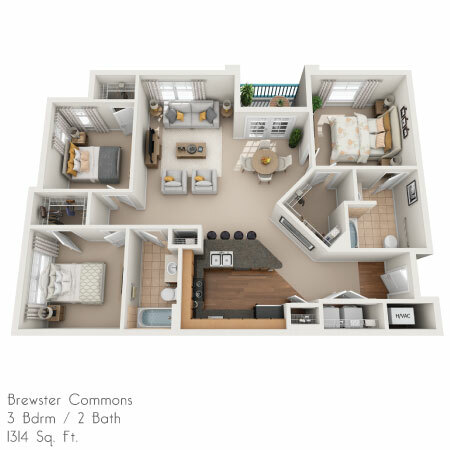 Brewster Commons is a gated community located within the Madisonville School District and the center of all conveniences of the River Chase community. 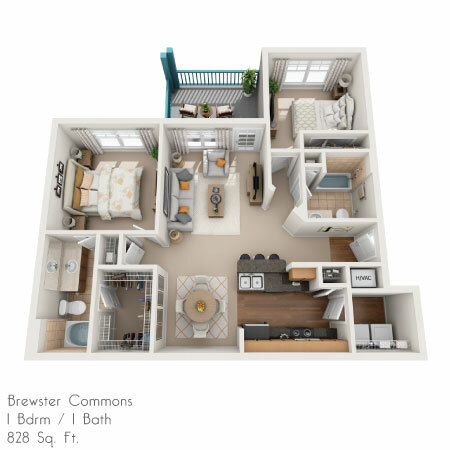 Reserve your new Brewster Commons apartment home today! 1 Pet (total maximum weight 65 pounds full grown): $200 deposit and a $300 non-refundable pet fee. 2 Pets (total maximum weight of both pets combined 65 pounds full grown): $200 deposit and a $400 non-refundable pet fee. Great location. Grounds are always well kept. Maintenance requests get taken care of promptly. I love this place and have been living here for more than four years (that says it all). We’ve lived here 20 months and absolutely love it. The staff is so friendly and helpful. The grounds are very well kept and our neighbors are great. I have meet a lot of nice friends here. The atmosphere is wonderful! I am excited to come home. Maintenance is always handled in a timely manner. The grounds are well kept. The exterior of the buildings have been freshly painted. The office staff is awesome to work with and willing to help when needed. Thanks ladies and gentlemen! Everyone at Brewster Commons were so helpful. Annie. Leslie, and Amy were so sweet always smiling and friendly. My apartment was ready for me to move in and enjoy. I am a Realtor and I recomend Btewster Commons all the time. Great staff, location, floor plans & amenities. 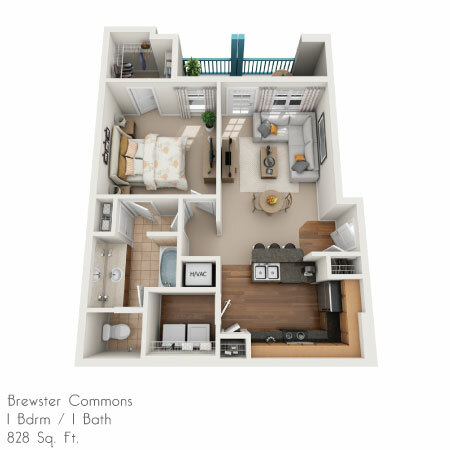 Brewster Commons also provides a flexible term on their leases, which meets the needs of short and long term tenants. I never had any issues during my stay here and would recommend this property to future residents. Absolutely amazing place ! Moving in soon and so excited ! Know many who live there who love it !! Beautiful apartments and "park like grounds,". Office staff , maintenance crew are so organized and helpful ! Looked at many other places, , No comparison !!! We chose Brewster Commons for our family and have been very happy so far. It's clean, quiet, and all the neighbors came out when we were moving in to say hello and introduce themselves. Rent charges are agreeable for the quality that you get, and the location is just so wonderful. Literally walking distance from grocery, pharmacy, and general goods. Staff has been very helpful and responsive both before the move and after. We moved from a house in a rural area to Brewster Commons and I don't feel like we've given up much of anything moving from a house to an apartment. 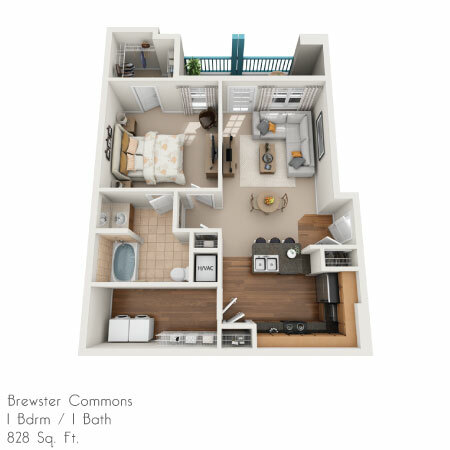 It's definitely a good size inside the 2BR / 2 BR unit. Not feeling squished at all. I don't live at Brewster Commons but am there often visiting a friend . I love this place . It is beautifully landscaped and the apartments have High ceilings . And sitting by the pool I always feel like I'm at. A Fancy Hilton . And most of all the neighbors are all so friendly . Everyone there is so happy ! And dog friendly , and the tenants are so good at picking up after their dogs . I absolutely love Brewster Commins . If I ever sell my house I would definately consider moving to Brewster Commons . My home away from home !!! Pros: Great location, friendly and helpful staff, decent response time to emails and problem requests, the office does a great job with Halloween and other events, well-kept pathways and lawns, the parking garages are nice, very nice pool, gym, and grill. Cons: only one dumpster location so you'll have to drive to other end of the complex to drop off trash, the gates don't always work (they're not turned on, broke, or off tracks), you will have people waiting at gates to get in without scanning or calling in, this also leads to people cutting you off when you try to enter (not so much apartments fault but it's very close to causing a wreck and I've reported multiple vehicles that live here doing it but nothing's really done), the walls are pretty thick but the bathrooms you can hear neighbors very well and yelling can be heard through the walls you share with neighbors. I WAS A TENANT HERE FOR ALMOST 2 YEARS AND WAS VERY SATISFIED WITH THE PROPERTY AND AMMENITIES. THE STAFF (PARTICULARLY AMY AND LESLIE) WERE EXTREMEMLY ACCOMODATING FROM THE VERY FIRST TIME I STOPPED IN TO INQUIRE ABOUT AN APARTMENT ALL THE WAY UNTIL I MOVED OUT. 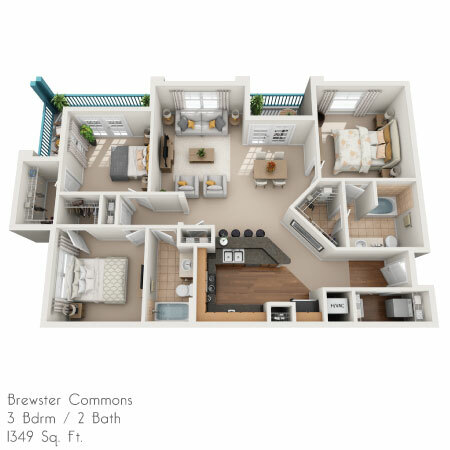 I WOULD HIGHLY RECOMMEND THIS PROPERTY AND IF I AM EVER IN NEED TO RELAOCATE BACK TO THIS AREA I WILL FOR SURE BE CALLING AMY AT BREWSTER COMMONS TO SEE IF I CAN MOVE BACK IN. My stay at Brewster Common was a very pleasant experience. The staff was always very nice and accommodating, especially Amy and Leslie. They were always very eager to make sure any issue was resolved as quickly as possible. They take great pride in making sure things are addressed in a timely manner and follow up with you letting you know it was resolved. First class run property and would recommend it to my family and friends. Love my girls up front there the best!!! "Home is the place where you feel in control and properly oriented in space and time; it is a predictable and secure place." For several months I searched, googled, and visited different apartments in Covington. I wanted an apartment I could call home that meets my needs and my budget. 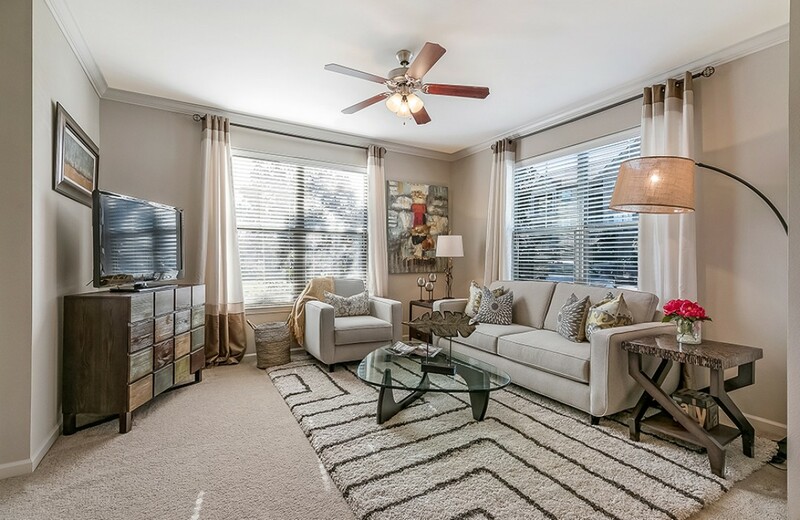 A place to feel secure, reliable maintenance, great lighting, updated appliances, landscape maintained, fantastic amenities, quiet, and honest, friendly management. Brewster Commons stole my heart on the first visit. The staff, Courtney and Leslie are very friendly, greets you with a smile, organized, and always respectable. Our residential common areas; swimming pool, hot tub, updated exercise equipment, game room, media room, lounge area, mail box units, and the parking lots are always very, very clean. We even have a designated area to wash our vehicle if needed. But most of all, l look forward to our "Know your Neighbor" parties that management sponsor monthly with games, food, drinks, music, and swell conservation. 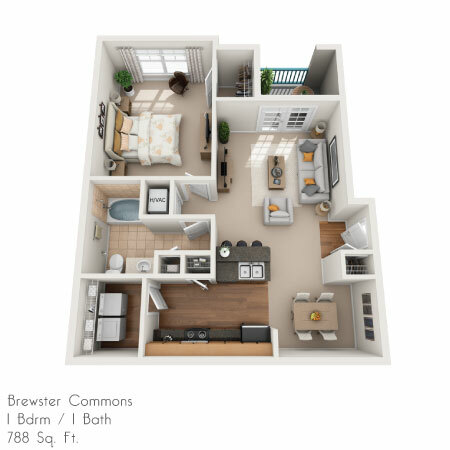 Brewster Commons is a fantastic family place to reside. Everything you need is nearby. I love it! The apartments are modern with all the amenities. They are very convenient to all types of shopping. But the best part of living here are the people who run it. They are friendly and concerned about everyone who lives here. Nice apartment and wonderful staff! Def recommend! The staff is very accommodating and friendly.